At the start of the run to the south, German gunnery, maybe with the advantage of better visibility and Vice Admiral Sir David Beatty’s ships being silhouetted, was outstanding. Lion was hit within three minutes of Lützow opening fire at 15:48. There were 98 fatalities. Here were the survivors. The din of battle was such that neither Chatfield, Beatty’s Flag Captain, not Beatty himself knew that the midships’ turret had blown up. 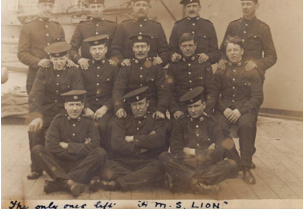 Lion nearly met the same fate as the other battle cruisers had it not been for the actions of Major Francis Hervey, posthumously awarded a Victoria Cross (see “The Victoria Cross at Jutland”). The middle person in the centre row is the great grand-father of the person who posted this photo a few years ago. His name was Edward Haynes. It was his writing at the bottom of the photo. I hope that his great grandson contacts me when he sees this photo.